Denver's Pepsi Center is certainly big enough to hold the Democratic National Convention with a capacity of nearly 21,000. And those 21,000 who have used their time, money, travel, lodgings, donations and supportive efforts will be waiting there eagerly for this Hustlers exceptance speech. But Obama has different and much loftier plans. Apparently the Pepsi Center is just not a big enough theater for Obama's giant Mile High ego. "On Thursday, August 28th, he's scheduled to formally accept the Democratic nomination in a speech at the convention hall in front of the assembled delegates.
" I wanted you to be the first to hear the news," campaign manager David Plouffe wrote in an e-mail to Obama's millions of contributors. "...Barack has made it clear that this is your convention, not his." 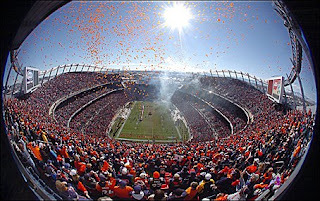 All this to take place at the nearby Invesco Field sports stadium; they are selling (legal?) Lottobama tickets too, for 5 bucks - where 10, yes TEN, of you raffeled Olucky-bama-ones get an all expense trip to the show!! Hurry while the supply lasts! And, Huston don't forget to bring those Che Flags for that Obama WAVE. This move shows more than a mere crowning arrogance - what it actually portrays in advance is a signal that there certainly won't be any chance of an embarrassing 'upset' - I think it means absolutely NO roll call at the Convention. Or if there is one somehow- he gets to slip out with the News coverage following him. Wouldn't want any dissention to be seen. Although the convention's host committee reported it was nearly $12 million short of the $40.6 million it had pledged to raise for the effort, the Host committee members spoke openly of needing the Obama campaign's help to close the gap. Gee Dean, didn't you get the checks? How much more than $12 mil do you need to pay for Obama's newest "Yes I yam," venue? I'll be happy to print you out another check. Why don't you take that $12 million-Plus it's gona cost, or the 500 million wasted on this 'historical' pre-post-racist BHO Farce you have selected, and use it somewhere it can do some actual good- like to Darfur, or New Orleans? Obama people's biggest fear seems to be that it may rain. In August? Rain on the parade? Well, it'd certainly be a chance to see Barack walk on water, I suppose. You might think that the Obam's would be more concerned about respect and gratitude rather than rain, but still, Obama is not going to Denver to thank the delegates and perhaps as many as 21,000 supporters waiting for him at the Pepsi Center Convention hall. No, he's not going to give an eloquent wordsmithed exceptance speech to those in waiting either. Instead he will leave them behind and travel to His Grander Coliseum, at Invesco Field, to be Coronated by the much larger crowd he invisions chanting his coming. I presume the 'new party' will watch all of this adoration unfold on a Big Screed Screen, while sippin' some sweety-free Kool-aid. For anyone offended by this "see yah!" affront, remember Obama probably, at some date or another, has consistently said,...You too will, 'get over it'. There you go people... 21,000 more under dah bus...but it's, "all about you - and not him"